Originally published in the WHO Goodwill Ambassador’s Newsletter for the Elimination of Leprosy, Issue No. 25 (April 2007). The information was correct and current at the time of publication. When Japan’s Leprosy Prevention Law was formally abolished in April 1996, Michihiro Koh claimed back his real name for the first time in 45 years. The second son of a Shinto priest, he was diagnosed with leprosy at the age of 17 and admitted to the Oshima Seishoen leprosarium, located on a small island in Japan’s Inland Sea, in 1951. His sudden disappearance caused consternation among his school fellows. Koh was advised to change his name so as not to “cause problems” for his family. Under the new name of “Masao Kozaki,” Koh joined the residents’ association of his sanatorium, and became an activist in the movement to seek the restoration of basic human rights for people affected by leprosy in Japan. By 1995, he had risen to the position of general secretary of Zen Ryo Kyo, the National Association of Residents of Hansen’s Disease Sanatoriums, a post he holds to this day. It was in that capacity that he announced at a meeting of residents’ association representatives on April 3, 1996, that he would start using his real name again. And there was yet another wall that had to come down . the wall within each sanatorium resident. Speaking for himself, Koh said, how could he reasonably expect prejudice to disappear from the world if he couldn’t bring himself to use his own name now that the law had been abolished? Supporting him in this action was his older brother, who understood the reasons behind his decision. But his mother was utterly opposed. The day before an interview with Koh appeared in a nationwide newspaper on May 4, 1996, a month after he had “come out,” his mother died of acute heart failure. When the news reached him . on the day the article was published . his first thought was that the shock must have killed her. 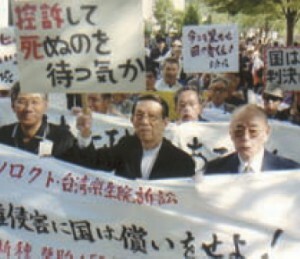 Five years later, when the Kumamoto District Court ruled in 2001 that people who had been incarcerated in sanatoriums should receive a government apology and be paid compensation (see facing page) General Secretary Koh was much in demand as a public speaker, and criss-crossed the country. But when supporters arranged for him to give a speech in his hometown, relatives resisted, in case neighbors discovered the family secret. With only his elder brother to back him, Koh abandoned the plan, but wondered why the one place he couldn’t speak was his boyhood home. Eventually, his relatives relented and he returned home for the first time in 50 years. Today, Koh lives with his wife in Tama Zenshoen in Tokyo, and remains active in the movement to eliminate stigma and discrimination. At the same time, he is at the forefront of efforts to secure the future status of Japan’s 13 leprosy sanatoriums, so that the 3,000 or so surviving residents can live out the remainder of their lives with dignity and peace of mind. As their numbers decline, there is growing anxiety among residents that the government will shut down some sanatoriums or merge them with others, and Koh is working with like-minded individuals in government and society to find a solution. He was one of the 16 people affected by leprosy who together with Goodwill Ambassador Yohei Sasakawa signed Global Appeal 2007 to end stigma and discrimination against people affected by leprosy, launched earlier this year in Manila.